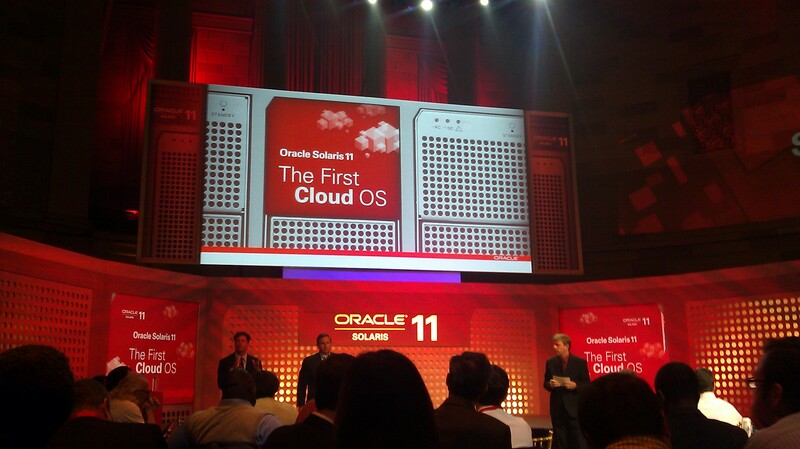 On November 9th, Oracle launched the new Solaris 11 enterprise operating system at Gotham Hall in New York. Whether or not you work for IT, Oracle’s new Solaris 11 just might change the way you work. We all know the drill… a new application is rolled out and their sales reps tell us that if you buy their product the world will be changed. Usually, the results are disappointing at best. Even good upgrades are so over-hyped that few products ever meet our expectations. However, Solaris 11 may be something different. Because of their market-leading position, even if their product fails to work as expected, their competitors will produce similar features and move the state of the art forward. Solaris 11 is all about the Cloud and getting you to build and move applications into the Cloud. While the “Cloud” has been pretty nebulous in the past, Solaris helps to clarify why hosting a service in the Cloud can help you. Let’s take a closer look. Distributed architecture: The operating system runs on servers, desktops, and other technologies. Processing and storage are distributed throughout the entire system, with most processing and storage happening on powerful servers and the “easy” processing of the client interfaced managed by laptops, iPads, smart phones and other devices that the user touches (although these devices can dynamically take on a larger role, when needed). Designed for sharing: The system is built to maintain security between different customers when they share the same network or even the same hard drive. Sharing is a strong, well-managed core feature and not a “bolt-on” afterthought. Scalable: Designed to be easily expanded or reduced in size, with little or no impact on user activities. Efficient: As the system grows, it becomes more efficient and the cost for a given level of service or storage goes down. Which is why there is so much talk about everyone moving to the Cloud. De-duping: Big network have duplicate files. Backup files are examples of intentional duplication. Examples of accident duplication are: every member of a team storing copies of a document, emails copied to many users, local servers storing copies of files from distant servers to speed up performance, forgotten files, and on and on. This raises the cost of: storage, restoring crashed servers, backup equipment, bandwidth (to move around duplicate copies), etc. Because Cloud services are always moving data around, good Cloud products need to know where everything is and need to test that the files you’re moving around is the right file. Not surprisingly, during all of this testing and moving the system constantly runs into duplicate files. Solaris has used all of this intelligence on your data to identify duplication and allow you to reduce it. Duplication varies, but 10% to 80% of total storage may be duplicate data. Control duplication and you can reap a HUGE reduction in cost and improvement in performance. Automatic updates: This has been out there for a long time, and little by little it has improved. Solaris 11 provides extensive automatic updating and recommends future updates, as well as automatically checking packages of updates to verify that they will all work together. Updates (and rollbacks from bad updates) will take less time, and fewer techs with fewer skills to manage the process. That directly translates into lower costs. Fewer desktop apps: By making the Cloud a more attractive location for applications, the desktop contains less software and less data. Overall, it takes less effort to maintain software. And again the total amount of resources needed to maintain our environment drops. Faster reboots: In very large and complex networks, when it is time to reboot the entire system everyone holds their breath and hopes to God that it all comes up all right. Because there are so many possibilities for unpredictable interactions, do very extensive testing and create elaborate plans (and add on massive amounts of staffing time) every time a reboot happens. Shorter, more predictable reboots mean lower maintenance costs. Dynamic reconfiguration: Many network have some form of on the fly fixing or self-healing. Solaris 11 allows you to make more changes and fixes without downing your network. Solaris provides tools to identify and resolve potential problems before they happen: low on storage space, about to exceed bandwidth, running out of processor capacity, or signs that a device is about to fail. Solaris has the ability to read obscure error messages, interpret them and communicate with your staff in plain (plainer?) language about network problems. “Intelligent” features rarely live up to their hype, but Solaris is state of the art for providing useful information on the state of your network. Preventing network failures almost always cost less than fixing a failed network. Solaris 11 is a powerful operating system that furthers the argument for moving applications to the Cloud. Solaris is a good option for large companies with different applications and operating systems coexisting on the same infrastructure, to simplify their networks, and reduce: downtime, maintenance time, and support staff. Oracle is only one of many players in the Unix Operating System Market, but Oracle’s nearly 50% share of the database market will drive users to Solaris, and dramatically both reduce long standing inefficiencies and move maintenance tasks from people to automated systems. If you mange an IT department, you should take a look at the cost of duplicated files and maintenance and work with your project managers to see if there is a business case for converting systems. If you are a service provider that has high IT bills, you should start talking to your Project managers and IT groups to understand just how much of your costs come from avoidable expenses. Solaris is just part of a much larger wave of changes in corporate computing, but it something that you need to keep an eye on. At least, that’s my Niccolls worth for today! This entry was posted in Best Practices, Common Sense Contracting, Decision Making, Delivering Services, Improvement, Continuous or Not and tagged Build vs. Buy, Cloud Computing, Database, Efficiency, outsource. Bookmark the permalink. 1 Response to Oracle Solaris 11: Is This The Ultimate Cloud Tool?